Here we are finally at one of the highlights of our Vietnam jorney: Ha Long Bay! With almost 2000 islands, this archipelago part of the Unesco World Heritage is a must see in Vietnam. Ha Long Bay is commonly reached from Hanoi, the easiest way is to book a cruise with some agency or hotel in Hanoi and then be transferred by bus for a 4-hour trip. Alternatively, some people prefer to go by bus from Hanoi to Cat Ba, and then opt for either a cruise from there or spending some nights on Cat Ba Island. There is also a third way, now we are sure to say definitely less beaten, to go from Hai Phong to Ha Long by bus (or from Hai Phong to Cat Ba by ferry): the reason we chose this option is because flights from Da Nang to Hai Phong were cheaper than from Da Nang to Hanoi, so we thought yeah why not. Well, we are happy we saw the laid back city of Hai Phong, but we certainly do not recommend this way as the easiest. We spent the night in a quite dirty and beaten guesthouse (we had got used to be treated in Da Nang), and had a walk along the large avenues of Hai Phong. In the morning we have to reach Ha Long harbour, about 50 miles away; “it shouldn’t be hard to get there”, we think. We are wrong. Let’s just say it could have been easier. We ask to a taxi driver to take us to the bus station and he nods, but we must soon correct him as we check the itinerary on the GPS. At the end of the ride he turns again in the wrong direction, so we get off and decide to go on walking. It’s time for us to get the first approach with north-Vietnam minibuses: we find it almost by chance when it’s about to leave, well actually they (the driver and his partner) find us, shouting out from far “Ha Long Bay Ha Long Bay!”. We will soon learn that here bus stops are an optional thing, you just need to be on the road and some bus will pick you up sooner or later. Obviously this no-bus-stop rule counts when you have to get off too, and we find it out on our skins when, trying to ask them to drop us at the harbour (the bus destination was Mong Cai, last city before China), the driver stops by and makes us gently step off at the end of a viaduct, pointing in an imaginary way to the harbour behind a hill and repeating “Ha Long Bay Ha Long Bay!”. Well thank you very much. After a few minutes of panic and bargaining with a man who believed he could bring us to destination, 3 people and 2 huge backpacks on a scooter, we find a taxi that drives us for the last miles. 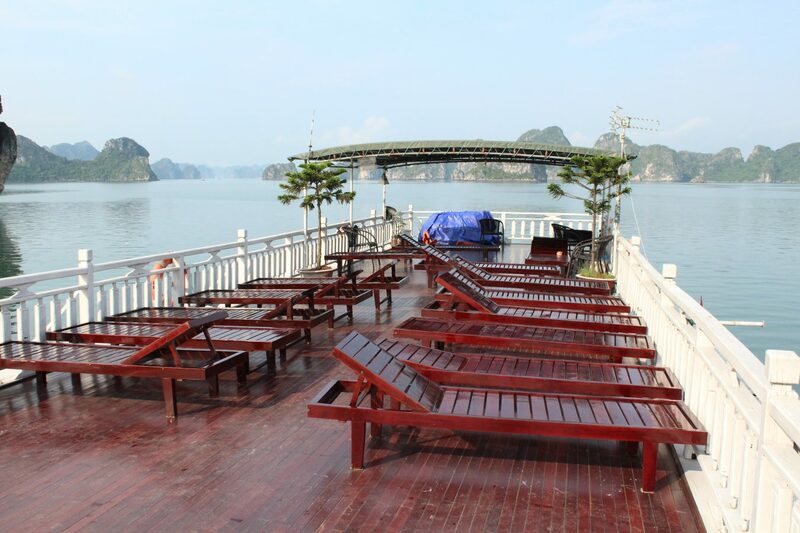 We had already booked a few days before the 2days/1night cruise through our hotel where we will stay in Hanoi. We got there by ourselves, so we have to wait for all the other passengers coming from Hanoi with the tour. At the harbour there’s a big coming and going, but not as much as we expected. The boats wait for the passengers some twenty meters away from the shore, small tenders take us on board. HOW DO BOATS LOOK LIKE? We had many questions about these boats, on the internet and by word of mouth we had heard discordant opinions and we didn’t know what to expect: from the outside our junk looks a little bit seasoned, but the inside is decorous, both our cabin, the restaurant area and the deck are very comfortable. After a nice abundant lunch with view on the mesmerizing bay that opens in front of us, the first stop is at a floating village where fishermen live and breed oysters most of all. At the end of the day they leave the village to go and sleep on their small huts docked offshore (the sea is usually placid in the bay). Then we head towards another islet where we embrace oars to do some kayaking through a scenic track among 3 small islands and a tunnel-grotto, followed by a bath in front of a long sandy beach. Our boat brings us further more eastbound from Ha Long Bay, precisely at Bai Tu Long Bay. The price we paid was higher because instead of staying in the busy Ha Long Bay, our boat would take us in a more remote area, less known to tourists and less popular. We are very happy with the choice we made, at night we dock for sunset in a wonderful spot, and the tour guide delights us saying “tonight we sleep here”. We are in a really isolated place, as calm and relaxing as breathtaking. After dinner, we try squid fishing (zero for Ambra), enjoy some music, and spend the night under the stars. A true paradise. The next morning after a good breakfast, we pay visit to a cave in yet another of the 1696 islets, Thien Cung: it is very nice but very busy as well. Later while having lunch, the junk heads back to the harbour in order to be there by 12. We are taken back to Hanoi, whilst crew members welcome aboard new guests for new cruises. 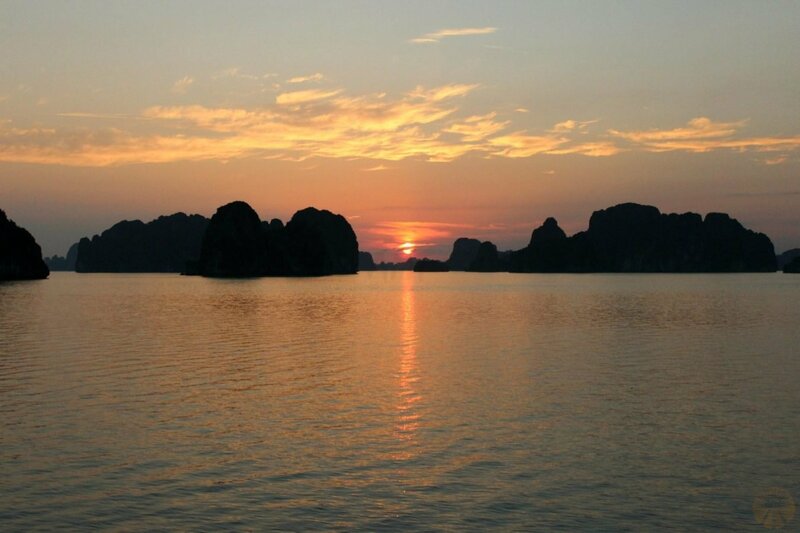 A cruise in stunning Ha Long Bay is an experience we definitely recommend to do, we had heard and read that some had complained about the food, the filth, the overcrowded boats and bay. 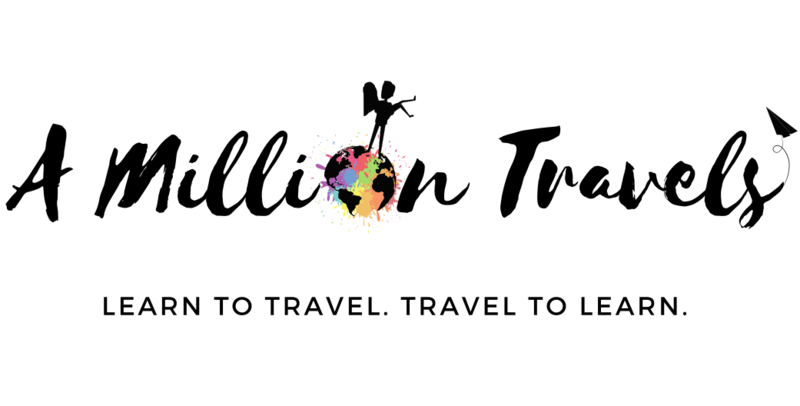 Spending a little more money and avoiding too cheap cruises that might result disappointing, you can still enjoy an authentic and worthy adventure in one of the most beautiful places on Earth. And we were lucky with the weather, a lot of sun and blue skies. The day after in fact, all the cruises were cancelled by the government for a 2-day storm forecast! We just got a thunderstorm on the way back to Hanoi, which extended the bus trip from 4 to 5 hour-long, but nothing too bad to take the smiles off our faces! Viola Cruise: A bigger junk, deluxe and family cabins, large deck. From 140$, 3days/2nights. You can pre-book all your accommodation in Vietnam with free cancellation here. Hanoi to Cat Ba by bus: from 300.000VND/person. Thank you for the information! Can you suggest the name of the tour company your went with? The company name was Viola Cruises, and our boat’s name was the Lemon Cruise! Very nice staff, friendly and helpful!